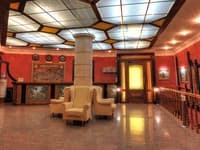 Yacht club, hotel, sauna, Turkish bath, restaurant - all gathered together in the hotel complex "Red Kalina". 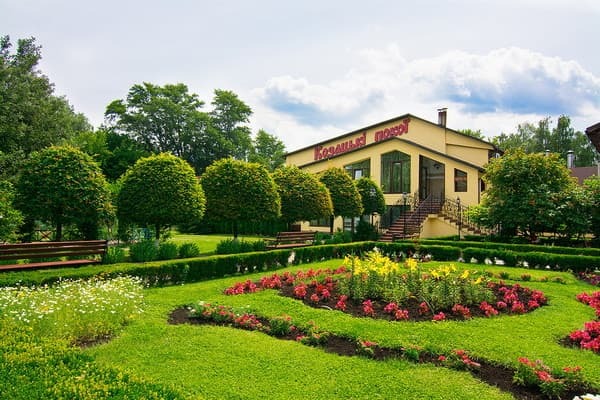 Visiting the property once, guests will never forget the hotel restaurant - a piece of paradise on the banks of the Dnieper. The unique and perhaps the only one in Kiev Ukrainian combination of nature, folk flavor with European service and facilities give customers a feeling of happiness and harmony with oneself and the world. 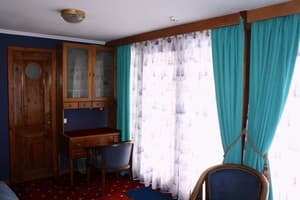 The hotel complex "Red Kalina" no two identical rooms. Each of the 22 rooms is decorated in its own unique style. 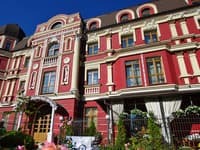 It is an island of exquisite Ukrainian leisure, where guests are greeted Ukrainian hospitality, arranging everything your heart desires: a sauna, a Turkish bath, a corporate party, wedding, birthday, seminar, conference. 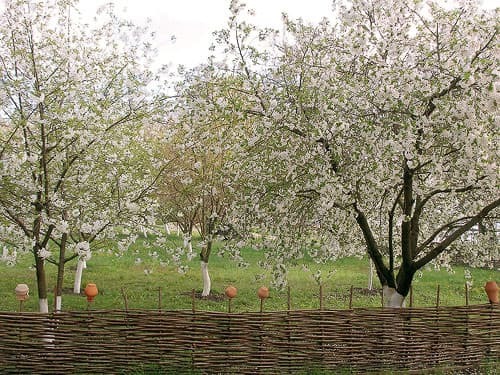 One has only to wish to escape from the city bustle, traffic jams, the human crowd, and a 5-minute drive from Downtown - the very center of Kiev - anyone can be in the arms of the cherry orchard, bushes of red viburnum, weeping willows that grow by the water, the scent of roses, mint, marigolds. Nearest st.m - "Petrovka". Distance from the railway station - 11.7 km from Boryspil International Airport - 38 km. Description of the room: Floating cottage "Kozatskaya Gull" is a comfortable apartment for year-round outdoor recreation for you, your family and your friends. 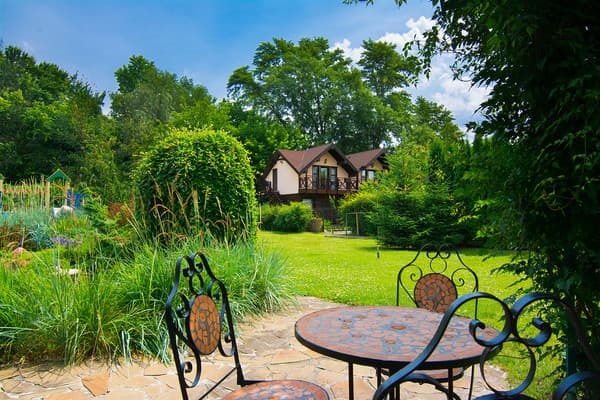 The cottage can comfortably accommodate up to 6 people (4 main + 2 extra beds). The cottage is equipped with exclusive furniture from natural environmentally friendly materials, equipped with air conditioning. 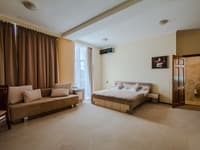 The cottage has 2 bathrooms, equipped with modern equipment; cabin-cabinet with a comfortable sofa, coffee table, armchairs and a secretary for fruitful work or negotiations; a spacious terrace (deck) with a stunning view of the Dnieper River and the surrounding islands. 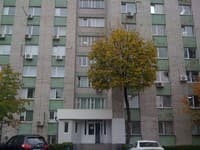 Отель расположен в тихом и уютном месте. Вокруг красивая природа. Extra bed 300 UAH. / Day. 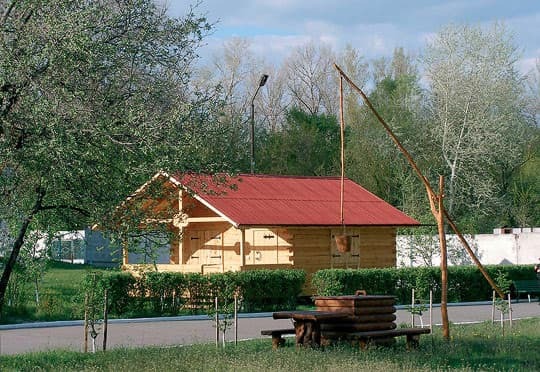 Hotel-restaurant complex "Chervona Kalina" is located on the bank of the Dnieper in the park "Friendship of Peoples" only 5 minutes away from Downtown - the very center of Kiev.